Governor Kim Reynolds in Pella along with Acting Lt. Governor Gregg and Senators Ernst and Grassley. Republican Governor Kim Reynolds says Iowa needs more legal immigrants to fill job openings and she “strongly” disagrees with some of the comments Congressman Steve King has made about the danger immigrants from places like Central America and Mexico pose to western civilization. 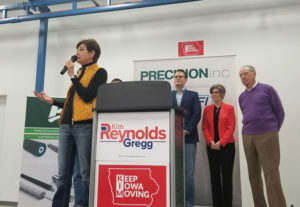 Hundreds of Democrats cheered loudly last night in Cedar Rapids as Reynolds’ rival Fred Hubbell called on Reynolds to remove King as a co-chairman of her campaign. “His reprehensible actions don’t represent Iowa values,” Hubbell said, to more cheers. Reynolds says King is “one of thousands” of campaign co-chairs who endorsed her bid for a full, four-year term as governor. Reynolds made her comments to reporters after a mid-morning campaign stop in Pella. “Double-down and do everything we can to make sure we that elect Republicans up and down the ticket,” Reynolds said to the crowd. Other Republicans on the 2018 ballot are appearing at the governor’s bus tour events. Chuck Grassley and Joni Ernst, the two Republicans who represent Iowa in the U.S. Senate, have joined Reynolds for stops today in Pella, Oskaloosa, Ottumwa and Columbus Junction. Hubbell is campaigning today in Spencer, Estherville and Emmetsburg.